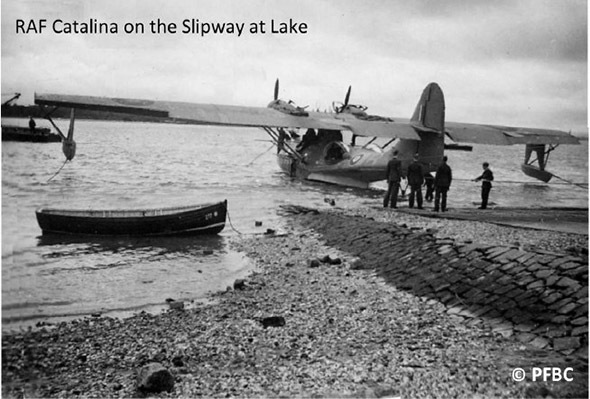 The pilot of a Catalina Flying Boat, which was one of the dozen stationed at RAF Hamworthy in World War 2, recounted his story of arriving back & alighting safely at Poole Harbour after an exhausting Bay of Biscay Patrol. 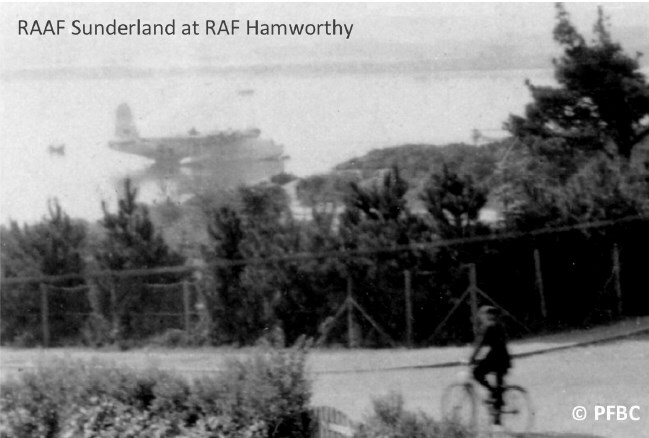 He told of the transfer of his aircrew by a small dinghy to the base at Lake, and a quick unpacking session before the journey to Salterns Pier by RAF Launch for a debriefing at 210 Squadron’s HQs in the ex-Poole Harbour Club.Then clambering on an old bone-shaker of a bicycle which had been issued to him, to make his way to the Mess, but having to endure a bumpy, arduous ride up Lilliput Hill & Bingham Avenue, etc. towards Harbour Heights Hotel. Next a ‘welcome’ wash & brush-up at his Quarters in the neighbouring Harbour Court, with a change of uniform, to join fellow officers enjoying the meal served by BOAC Stewards, who had been recruited from pre-war Liners. 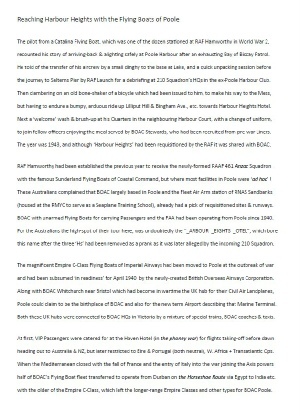 The year was 1943, and although ‘Harbour Heights’ had been requisitioned by the RAF it was shared with BOAC. 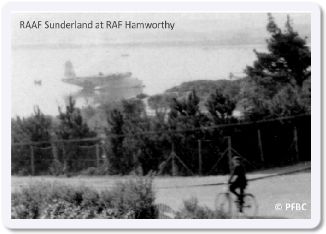 RAF Hamworthy had been established the previous year to receive the newly-formed RAAF 461 Anzac Squadron with the famous Sunderland Flying Boats of Coastal Command, but where most facilities in Poole were ‘ad hoc’ ! 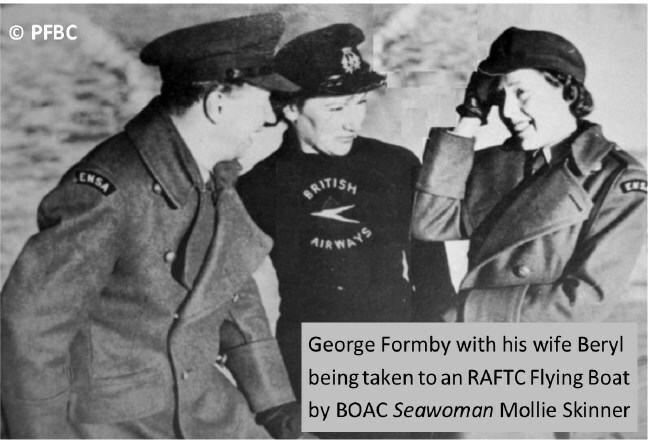 These Australians complained that BOAC largely based in Poole and the Fleet Air Arm station of RNAS Sandbanks (housed at the RMYC to serve as a Seaplane Training School), already had a pick of requisitioned sites & runways. BOAC with unarmed Flying Boats for carrying Passengers and the FAA had been operating from Poole since 1940. For the Australians the high-spot of their tour here was undoubtedly the “_ARBOUR _EIGHTS _OTEL”, which bore this name after the three ‘Hs’ had been removed as a prank as it was later alleged by the incoming 210 Squadron. The magnificent Empire C-Class Flying Boats of Imperial Airways had been moved to Poole at the outbreak of war and had been subsumed ‘in readiness’ for April 1940 by the newly-created British Overseas Airways Corporation. Along with BOAC Whitchurch near Bristol which had become in wartime the UK hub for their Civil Air Landplanes, Poole could claim to be the birthplace of BOAC and also for the new term Airport describing that Marine Terminal. Both these UK hubs were connected to BOAC HQs in Victoria by a mixture of special trains, BOAC coaches & taxis. At first, VIP Passengers were catered for at the Haven Hotel (in the phoney war) for flights taking-off before dawn heading out to Australia & NZ, but later restricted to Eire & Portugal (both neutral), West Africa + Transatlantic Ops. When the Mediterranean closed with the fall of France and the entry of Italy into the war joining the Axis powers half of BOAC’s Flying Boat fleet transferred to operate from Durban on the Horseshoe Route via Egypt to India etc., with the older of the Empire C-Class, which left the longer-range Empire Classes and other types for BOAC Poole. With the threat of invasion, the home-base for Officers & Passengers had been moved away to ‘Harbour Heights’. After surviving Dunkirk, the Green Howards built defences at Sandbanks, along the coast & around Poole Harbour to be inspected by PM Winston Churchill, who always opted to stay near Alum Chine (with secret escape tunnels) and not within more vulnerable Poole, though his son Randolph was put-up here by BOAC on three separate occasions. By 1944, with the events swinging in favour of the Allies, there was another arrival at Poole, and ‘Harbour Heights’ of RAF Transport Command which operated alongside BOAC, in gradually reopening the routes to India & beyond. Its two dozen converted Sunderlands, which had been demilitarised in their RAF markings could fly across warzones. These replaced the RAF 210 Catalina Squadron, as RAF Hamworthy with its 2,000 personnel was gradually closed, so that ‘Harbour Heights’ had a new set of Officers, various of whom would later be transferred to BOAC postwar. A significant number then set up family-homes in Poole and also continued to enjoy ‘Harbour Heights’ hospitality. With V-J Day there was no need for the Flying Boat Division of Transport Command, so BOAC took over all routes. New services from Poole began to Hong Kong, China & Japan; to South America; and to the Seychelles via East Africa. In the period before peacetime, ‘Harbour Heights’ featured prominently with BOAC’s elite aircrews flying a trio of American-built Boeing 314As Bristol, Berwick & Bangor, on Transatlantic flights direct to Poole rather than via Eire. They wore American-style uniforms, and associated with famous US Passengers who stayed at ‘Harbour Heights’, such as well-known film stars, actors, comedians and other entertainers - alongside the diplomats & businessmen. 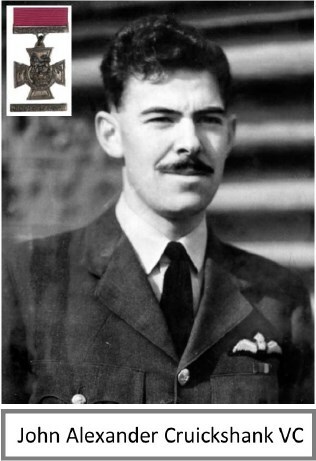 Meanwhile, the pilot who endured his bike rides was F/O John Alexander Cruickshank, who after his stint at Poole continued his service on 210 Squadron (which had re-formed at Sullom Voe in the Shetlands), against the U-Boats, this time patrolling the Arctic and Norwegian Waters, where his Catalina encountered and sank U-361 in July 1944. With a crew member dead and six injured, including some 70 wounds he had received, he safely returned to Sullom to be honoured with the Victoria Cross; to become today the oldest recipient, and the treasured Friend of PFBC.